Why Swim with Surfshark VPN? What makes Surfshark so great? If you’re on a budget and hunting for a top-notch VPN that offers the best security and privacy features, you can save up to 83% if you know where to look. Get ready to open up and bite off as much as you can chew by getting the Surfshark coupon and enjoying a huge discount for new users. Below, we walk you through how to sign up and take advantage of this great deal that saves cash and allows you to connect safely and securely. The standard Surfshark deal for their 24-month plan is $3.49 per month. However, we found you extra savings with the “surfsharkdeal” coupon code. If you click on the image below, it will take you straight to the hidden page, with the coupon code already there. Remember, to get the full 83 percent discount; it’s a 2-year commitment billed up front. Direct your browser to Surfshark’s website . 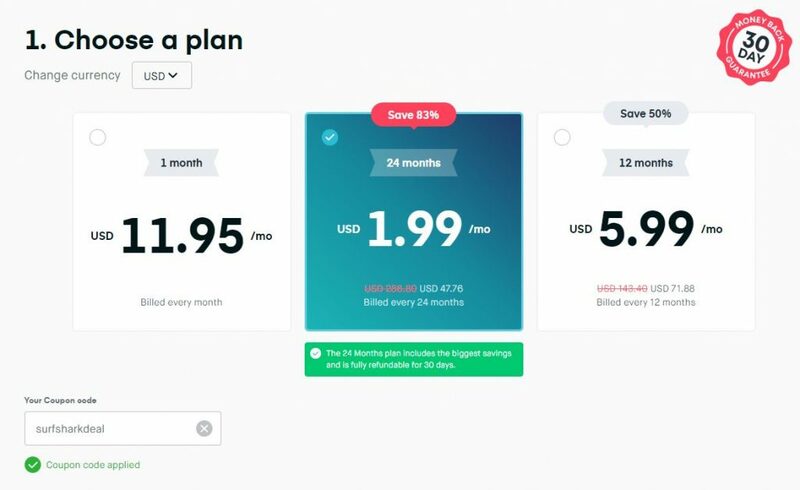 Choose the plan offering an 83% discount. Provide your email address and payment information. Unfortunately, there are plenty of fake or misleading clickbait coupon sites. They’re unethical, they’re annoying, and they make us all skeptical of genuine discounts and coupons. We’re big believers in establishing trust through our reviews and educational cybersecurity content. We prioritize truth in advertising and verifying the claims of the companies and services we endorse. That’s why our team painstakingly checks the authenticity and expiration dates of every coupon we promote. 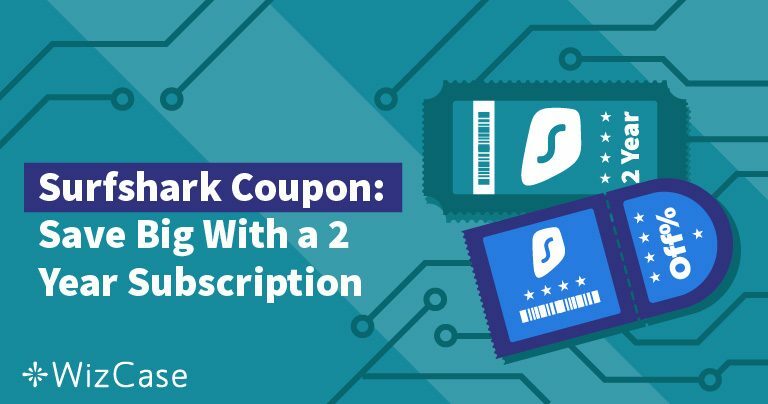 In this case, we found a legit coupon offer for Surfshark that’s guaranteed to work, and it’s awesome. Here’s the deal; sign up for a two-year plan, and you can get Surfshark for just $1.99 a month. Overall, this is a massive saving compared to the usual price. Better yet, this Surfshark coupon is current, active, and ready to use today. Surfshark is a user-friendly VPN, with a sleek but straightforward interface. An easy setup process and plenty of security features rival the best VPN providers on the market. Surfshark unblocks geo-restrictions for the most popular content platforms, including U.S. Netflix, Hulu, ESPN, and BBC iplayer. Additionally, it also allows torrenting and P2P sharing. Also, Surfshark provides obfuscated server technology. With this, your online privacy and neutrality are improved, and bandwidth throttling will be less frequent. Another perk is the capability to whitelist certain apps to bypass the VPN proxy server. For example, if you have a parking app or a banking app, you can whitelist those, so they give you full functionality and convenience. We know that high-quality VPNs can cost you. But, it’s a valuable service, and to keep your privacy intact, you need to pay for quality. Free VPNs just don’t cut it. At Surfshark’s average monthly price, they are still competitive with leading VPNs who use the latest and greatest security protocols and encryption technology. However, using a Surfshark coupon, the service is very affordable. Surfshark is compatible with all devices in your home, from desktops and tablets to smart appliances. Surfshark supports a wide variety of platforms and apps including Windows, Mac OS, iOS, Android, and Linux. Additionally, there are also browser extensions for Chrome and Firefox. Somewhat uniquely, Surfshark allows connections on unlimited devices with one account. Protecting everything on your network makes this deal even better value. Troubleshooting is a breeze. Surfshark’s online user guides are intuitive, and they have a helpful FAQ guide and expert customer support 24/7, with live chat employees who respond promptly. With over 800 servers in 50 countries, Surfshark delivers blazing-fast speed that is ideal for gaming, streaming, torrenting and more. When it comes to cybersecurity, Surfshark is proven. Surfshark’s servers use OpenVPN and IKEv2 security protocols with its military-grade AES 256-bit encryption to keep your browsing sessions secure and your personal information private. They also guarantee privacy with DNS leak protection, a strict no-logging policy, and provide a built-in kill switch to keep all your data safe and secure even if there’s an outage. Additionally, the CleanWeb feature blocks ads, malware, trackers, and even phishing attempts. Want to dip your toe in the water before swimming with SurfShark VPN , the company offers a 30-day money back guarantee so that you can test all the features with confidence. Dive in, and snag yourself this jaw-dropping discount before it gets away. Nick Soucy is passionate about cybersecurity and cutting-edge technologies—especially those that safeguard online privacy and First Amendment expression. He also has a deep curiosity about artificial general intelligence (AGI) and the philosophical sciences of futurism and transhumanist evolution.